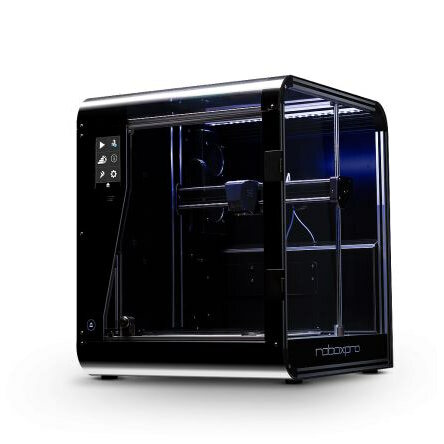 The CEL RoboxPro is a newly released professional grade, dual material 3D printer with loads of cutting-edge features. It comes with 3 interchangeable print heads to match your design needs. It is also backwards compatible with existing Robox print heads. AutoMaker is the user-friendly software for the RoboxPro — it takes the complication out of using multiple materials with the ability to detect and auto-populate filament data. You also have the ability to pause and resume the build process at any time, and if any errors arise, AutoMaker will alert you. Additionally, you can check the print status remotely from a mobile device or computer. The RoboxPro also has an installed HEPA filtering system to ensure safe printing. This filtering system reduces the smells and harmful emissions. So easy to use, eventually everyone will upgrade to this after fighting with a reprap. I’ve battled everything from bed levelling to warp via the insane list of settings available in all the slicers. Robox had solved all the problems before I opened the box. Design – print. Is this machine able to handle flexibles- TPE TPU or NinjaFlex types with the Bowden Tubes and 1.75 mm filament? besides Ethernet, WIFI- am I able to manually bring Sliced files to this printer using an SD card or a USB Stick?